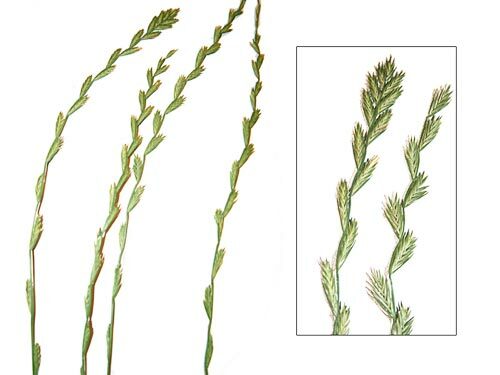 AgroAtlas - Crops - Lolium perenne L. - Perennial ryegrass. Family Poaceae Barnhart., genus Lolium L.
Chromosome number: 2n = 14 (diploid), 2n = 28 (tetraploid). Perennial plant, robust, medium size, hairless, cespitous, forming dense tufts when grazed. Stems erect, 70-80 cm high. Blade folded when young, narrow (2 - 6 mm), rather long (3 - 20 cm), dark green, shiny on the lower side, veins well marked on the upper side. Ligule short, greenish to transparent. Auricles narrow. Sheaths of the inferior leaves red to purple-red. Spike-like inflorescence, 8-15 cm. Spikelets applied on the axis by one of their sides. One glume per spikelet except on the top spikelet where there are 2. Glume shorter than the spikelet. Spikelets -have 5-10 flowers. Glume(s) exceed(s) usually the inferior lemma. Lemma without awn (not aristate). The weight of 1000 seeds is 2.2 to 2.5 g. Blossoms in June; seeds ripen in July. Cross-pollinated by wind. Introduced into culture in the second half of the 19th century. Cultivated on small plots in the forest, steppe and mountain areas in 25 regions and republics of the former USSR. 10 breeding cultivars for forage and pasture purposes have state permission for utilization, while 23 may be used to plant lawns. Mesophyte, adapted to mild, humid climate. Not resistant to drought, can.t withstand excess moisturizing, but is able to withstand small amounts of standing water in spring. Not very cold-resistant or frost-resistant, although it is resistant to early fall and late spring frosts. Less drought-resistant than Dactylis glomerata and less cold-resistant than Phleum pratense. Grows best on rather heavy, rich, moist soils, but does well on well-manured lighter soils with sufficient moisture, pH 6-7. Medium salt tolerance. Quite sensitive to shade. An excellent pasture grass. Tolerates heavy grazing, but does not persist in meadows cut regularly for hay. Good palatability by cattle, sheep, goats and horses. High-yielding in mixtures with alfalfa, Lotus corniculatus, Trifolium pratense, Trifolium medium, sometimes with grasses. Re-growth in the second half of April, useful for pasture in the beginning of May. Good re-growth after 3-5 grazings. Nutritive value is equal to that of Phleum pratense and Festuca pratense. Used as a lawn culture. Improves soil fertility and structure. Used for erosion control. The hay yield (in the pasture utilization) varies from 5,0 to 8,5 MT/ha. Seed yield is approximately 400-1200 kg/ha. Medvedev P. F., Smetannikova A. I. 1981. The forage crops of European part of the USSR. - L.: Kolos, 336 pp. (in Russian). Shashko D. N. 1967. Agroclimatic region of the USSR. - M.: Kolos, 335 pp. (in Russian). Shashko D. N. 1985. Agroclimatic resources of the USSR. - M.: Kolos, 248 pp. (in Russian). Copyright on the photos belongs to Dzyubenko N. I.